The moon is our nearest neighbor in space, it’s easy to find, it’s bright, and you don’t have to go anywhere special to view it. During events like the recent Super Blood Moon Lunar Eclipse the moon is a spectacle to behold, however as many reading here know, it’s always a spectacular place with interesting things. Astronomer John A. 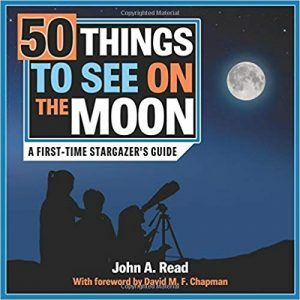 Read has published a new book, 50 Things to See on the Moon, providing his thoughts that are organized by the phases of the Moon. As each day passes, an additional slice of the Moon becomes visible. With each slice comes new craters, lunar seas, and jagged mountain ranges. Read’s journey into astronomy began as so many have – with a drug store telescope. He was fascinated that it was possible to observe the moon and Saturn with its rings with such meager equipment. He knew he had to share these views with others. He started astro imaging, buying increasingly better equipment. He also joined the local Mount Diablo Astronomical Society in California and was awarded the Joe Disch award for volunteering at almost 50 star parties in a single year. 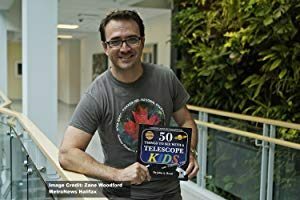 He wrote his first book, 50 Things to See with a Small Telescope, upon discovering that many students who owned telescopes didn’t know how to use them. Self-published in 2013, it quickly became successful, often leading Amazon’s stargazing and astronomy best-seller lists. It has been translated into 10 languages. He has also published the book 50 Targets for the Mid-Sized Telescope and a children’s book: 50 Things to See with a Telescope – Kids. After writing his first book John retired from his career in corporate finance. John is now a telescope operator at the Burke-Gaffney Observatory, sits on the board of directors at the Halifax Centre of the Royal Astronomical Society of Canada and is studying astrophysics at Saint Mary’s University. He lives in Halifax, Nova Scotia. Read is also a science fiction writer having written two novels, The Martian Conspiracy and its sequel, Callisto Deception. All of Read’s books are available through Amazon.